The small Central Asian nation of Kyrgyzstan can't get a break from the U.S. media, who can't spell it or get basic facts right about it — such as its existence. Caldwell was in Kyrgyzstan, not Kyrzbekistan, which does not exist. This is a picture of Mount Putin in Kyrgyzstan, which is an actual mountain actually named after Vladimir Putin. The Times was evidently confusing Kyrgyzstan, a small, mountainous republic in former Soviet Central Asia, with Uzbekistan, its much less mountainous Western neighbor. @miriamgottfried I just bought a beachfront condo in Kyrzbekistan. It exists! And btw, the Shanghai Cooperation Organization does not seem to list #Kyrzbekistan among its members. Opening for U.S. diplomacy? @kyrzbekistan @OliverBullough I think Harry Redknapp has his eye on a triffic left back from #Kyrzbekistan in the January transfer window. ...and, as is now de rigeur, gained its own unfunny parody account. The article's author gracefully fell on his own nonexistent sword. If anyone needs me, I&#x27;ll be in @kyrzbekistan, which is only fitting, since I&#x27;m the one who made it up. If anyone needs me, I'll be in @kyrzbekistan, which is only fitting, since I'm the one who made it up. It's been a rough few days in the Western media for Kyrgyzstan, which has largely faded from view since a revolution in 2010 and ensuing ethnic violence between ethnic Kyrgyz and Uzbeks in the southern city of Osh, near the Uzbek border. Ethnic Uzbek refugees, who fled the violence in Kyrgyzstan, wait for their turn to cross the border to Uzbekistan near the village of Jalal-Kuduk, June 14, 2010. Despite actually going there to make a documentary dubiously portraying the country as a hotbed of ISIS recruitment, Vocativ incorrectly referred to it as the "Kyrg Republic." 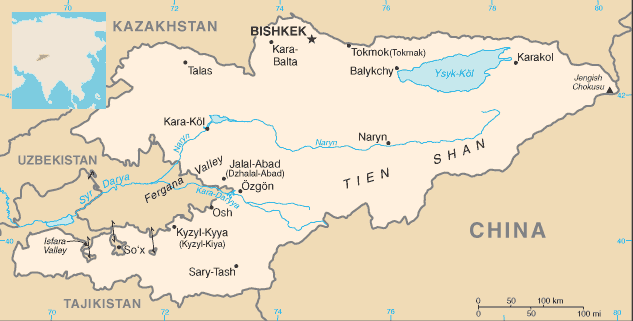 Host Michael Kay calls Kyrgyz people "Kyrg nationals" and refers to the capital, Bishkek, as "Bishek." In an article about Kyrgyz-born accused Boston Marathon bomber Dzhokhar Tsarnaev on Monday, Vox described it with a series of glaring factual errors claiming that the Tsarnaevs lived in a "Chechen enclave" where they had been forcibly moved on Joseph Stalin's orders in the 1950s, a decade after the deportations happened. Many foreigners struggle to differentiate the five Soviet "stans" in Central Asia, whose names — Kazakhstan, Kyrgyzstan, Tajikistan, Turkmenistan, and Uzbekistan — aren't the easiest to spell and pronounce. Kyrgyzstan, which U.S. Secretary of State John Kerry once called Kyrzakhstan, is particularly tricky, because its name is full of vowels that don't exist in English. Reach down into your gullet for a deep, throaty "uuuuyyyyyhhhh" like you've been slapped on the back to kick a cough and you'll get the idea. The countries, traditionally home to nomads and farmers, only came into being when Stalin drew borders on ethnic lines in 1920s to prevent them from rising against Soviet rule and only gained their independence when the USSR collapsed. Kazakhstan's president, Nursultan Nazarbayev, even proposed dropping the "stan" (which comes from an old Persian word meaning "land") last February in a hope of helping his country stand out. "In our country's name, there is this 'stan' ending which other Central Asian nations have as well. But, for instance, foreigners show interest in Mongolia, whose population is just two million people, but whose name lacks the 'stan' ending," Nazarbayev said. His proposal to rename the country Kazakh Yoli, meaning "The Land of Kazakhs," was quickly shelved after Moscow stoked separatist passions among Russians in Ukraine, raising fears the same could happen in Kazakhstan's mostly ethnic Russian north.